Conversion Location: Chicago, IL (location varies—the beach, person’s home, etc. There is one Divine in all the universe, for which we have different names, stories, operating systems. Knowing this, I have done a lot of what I call Beyond Interfaith work, where instead of a “you show me yours and I’ll show you mine and we’ll all clap politely and go home” experience, we actually pray to the same God together. I have gone all over the Jewish landscape to pray and learn and am comfortable just about anywhere (as long as they are not rude to me about my kilt). After working full time for 11 years on the streets of Chicago with LGBTQ and/or homeless youth, I started a game company and a spiritual direction practice. We mostly make tabletop games with social impact (the first one is about homelessness). In addition, I am a partner at AlleyCat Comican s in Chicago. 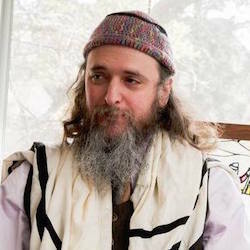 During all this, I have been the founder and rabbi of the Mitziut Jewish Community, an alternative, independent Jewish community that gathers for Shabbos, holidays, learning and schmoozing, all with a spiritual and mystical flavor. I also co-founded the now defunct Black Rock JCC. My past work includes working with isolated and lonely seniors at Little Brothers/Friends of the Elderly in Minneapolis and with deaf children with behavior and emotional issues at the Center on Deafness in Northbrook, IL. The strangest job I had was recording the meters on gas pumps at stations after they closed. Most importantly, I am a dad. In closing, I don’t have answers for you. I have information and questions. I will accompany on your spiritual journey, sharing my experience and education, as you seek answers (or at least responses) to your questions.